his session will examine the historical reasons why the performance and financial cost impact on the z/OS infrastructure has been difficult to test in DevOps organizations. We will also discuss an architecture and modernized methodology to utilize built-in (artificial) intelligence on the vast infrastructure performance and configuration data (RMF/SMF). The mainframe skills gap makes a difficult job harder, especially in the area of z/OS performance and capacity planning which requires deep expertise across all the areas of the infrastructure. Modernizing how you analyze and interpret your RMF/CMF & SMF data using AI techniques makes the best use of your current deep experts, and helps newer staff get up to speed sooner. New insights are obtained by automatically interpreting the RMF and SMF data using embedded expert knowledge about the I/O workloads within the context of the specific storage infrastructure in use. See how AI techniques such as embedded expert knowledge are used to dynamically generate intelligence from data and realize its true value. Beginning with z13 processors and continuing with z14s, customer experiences have confirmed that delivered capacity is more dependent than ever before on effective utilization of processor cache. This session covers how to interpret the SMF 113 metrics to optimize your environment and reduce CPU consumption and MLC software expense, and reflects findings from analyzing detailed processor cache data from 50 sites. This webinar will discuss and demonstrate how intelligence is generated, and how it can proactively solve both performance and space oriented problems, including understanding burn rates and forecasted exhaustion dates. 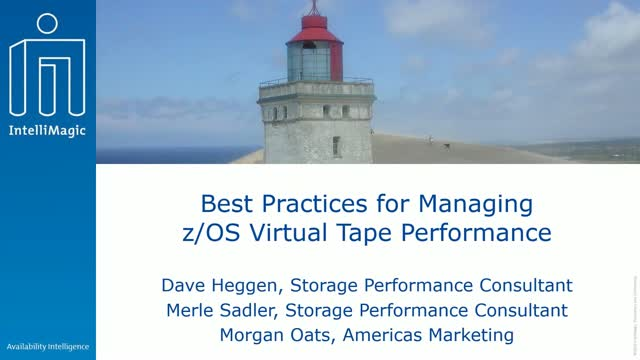 Focusing on z/OS storage operations and performance, this webinar will demonstrate how to leverage mainframe performance data to provide predictive intelligence that will enhance your availability and bring value to your z/OS ops and performance management teams. Have you ever been stumped by a performance issue in your IBM Spectrum Virtualize Environment? If so, this session is for you! It is designed to help users understand how to approach, manage and correct performance issues in an IBM SVC environment.